Abstract: 3D Bio-Printing arises from the intersection between 3D-printing and cell encapsulation techniques, allowing for the creation of bio-constructs with programmable spatial disposition of cellular and extracellular matrix components (bio-ink) . At the Italian Institute of Technology we are developing a bioprinter based on the microfluidic wet-spinning of cell-laden fibers suitable for many different bio-inks. The use of microfluidic platforms coupled with 3D deposition offers the possibility to define the composition and disposition of different bioinks using a single print-head, allowing for the easy creation of heterogeneous constructs. The microfluidic platforms can be used to vary on-the-fly the density of cell seeding during the printing process, as well as the composition of the embedding ECM. Furthermore, the manipulation of different bioinks at the microscale permits to produce heterogeneous fibers containing different types of cells, disposed in pre-determined patterns, allowing for the creation of complex and highly reproducible co-culture models. Summary: An overview on how the incorporation of microfluidic platforms in 3D-bioprinters can open new routes in the creation of heterogeneous, tissue-specific bio-constructs and in the high-throughput screening of bioinks compositions for regenerative medicine and in vitro tissue modeling.References:  Murphy, Sean V., and Anthony Atala. 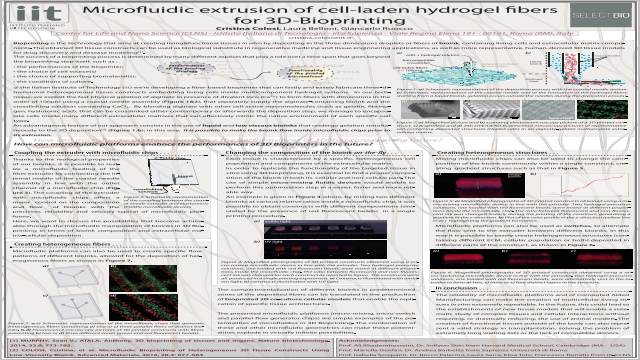 "3D bioprinting of tissues and organs. "Nature biotechnology 32.8 (2014): 773-785. Colosi, Cristina, et al. "Microfluidic Bioprinting of Heterogeneous 3D Tissue Constructs Using Low‐Viscosity Bioink." Advanced Materials 28.4 (2016): 677-684.